Hover your mouse over the People shortcut at the bottom of the Outlook 2013 window and up pops a little window with your favorite contacts in. Here you can see a few people that I have added to my favorites. A user is unable to add Microsoft Dynamics CRM entities to the Microsoft Outlook favorites when using Microsoft Dynamics CRM Client for Outlook with Microsoft Outlook 2010. 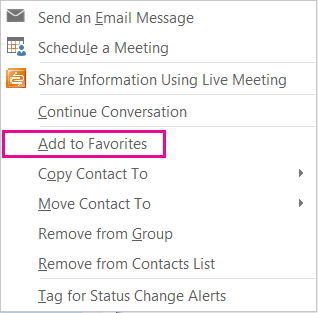 Cause Solutions Module in Outlook 2010 prevents CRM folders from being added to the favorites section.